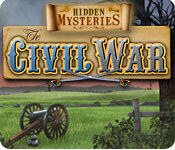 Hidden Mysteries - Civil War is rated 2.3 out of 5 by 26. Rated 4 out of 5 by anokinono from Plain, Simple, and Delightful I bought this game on a whim, before I even knew about the existence of BigFishGames, or this website. I didn't have any reviews to go off of, but having read the ones posted I know that I would have missed out on an amazing game. It is a very simple storyline and has simple gameplay, but that is what makes it enjoyable. It isn't like the newer games with puzzles that almost require a strategy guide to beat, or all the fancy bells and whistles that newer games have. The visuals are basic, as is the level of challenge. It is a great basic game to introduce new players to the hidden object genre. Something easy to start them off to before they venture on to more developed, more complicated games. Rated 4 out of 5 by hhhh1 from Something's wrong Good game, but on the Wilderness level, if your list includes the kerosene lamp, you are finished. The game does not recognize your selection of the lamp, even when it is highlighted by the hint function. Rated 4 out of 5 by mspaws from Like it! This was the first game I played in the series and it is a bit slow but still fun to play. LOTS of HOS which is a BIG plus in my book. I am not into running from place to place and putting things together.....so this was a wonderful game for me! Rated 3 out of 5 by JustTheFacts from Surprisingly Good With Captivating Story BASED ON DEMO . FIRST IMPRESSIONS I decided to review this game because the later games in the series are such a mixed bunch, I thought I’d see where it all started. Well, it started in 2008 with this game, and it is remarkable how good it seems even now, almost 6 years later. SIGHTS & SOUNDS The graphics are of course, no good. No point expecting anything else. And the HOs are often so tiny, that this poor quality affects gameplay. But, for its day, this game did well. The sound tracks are wonderfully atmospheric, martial music of the period, cannon fire, shouts, bugles, all accompanying the more beautiful peaceful sounds of a nearby brook or bird song. The contrast is brilliantly done. 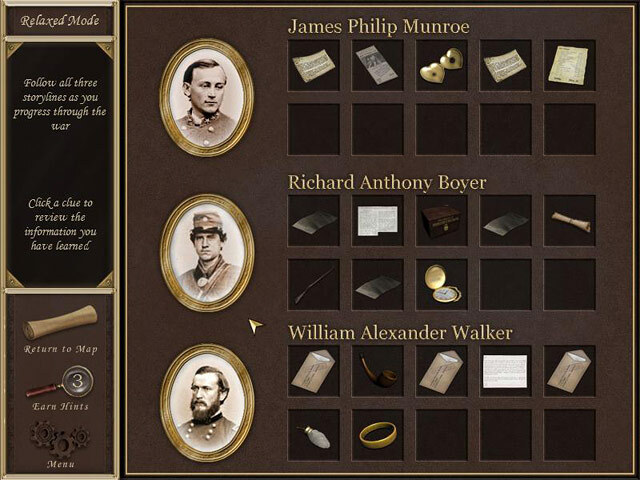 WHAT’S HAPPENING This game provides large amounts of information, about the facts of the Civil War in the US in the 1860, and about the fictional story of a secret society amassing untold wealth. Each level brings with it letters, reports and biographies about real people, about the politics and issues of the times, and how it led to devastating war. MAKING PROGRESS This is a HO game. Within each chapter, there are a number of “battle scenes”, also known as HOP scenes *grin*, where you are given a list of items to find. The objects are tiny, and the scenes are distance views, no close ups unfortunately. 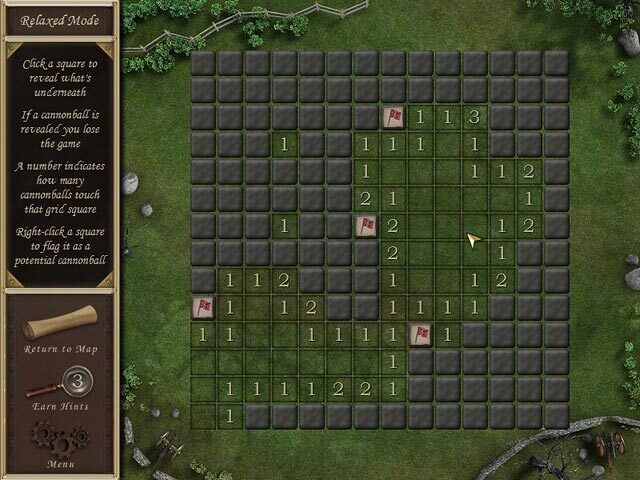 There is usually a letter to be found in the scene, as well as a puzzle to do, one per level. These puzzles cannot be skipped, but they are easy. As you progress, the number of scenes in each level increases. This is to increase the degree of difficulty if you are playing timed mode. But you can opt for untimed and relax. Hints are limited, and I never did find out if there was a way to increase them, but it was awfully difficult not to use them up, even at the earlier levels. LAST WORDS I admit that this game will get on your nerves if you are not into the history and/or the story, and also if you do not like repetition, because you will visit all HOP scenes more than once. But for a straight HO game, I found it imaginative and interesting. Nevertheless, it isn’t a game I could recommend, except to collectors, fans of classic games or history buffs. Rated 3 out of 5 by gamefan10 from The storyline kept me going As other reviewers have mentioned, the hidden objects are incredibly tiny and difficult to see. This ruined the game for me. The only reason I kept playing is stubbornness and also wanting to know what happened to the characters. Some of the facts in the storyline were true, and others were not, especially at the end of the game. 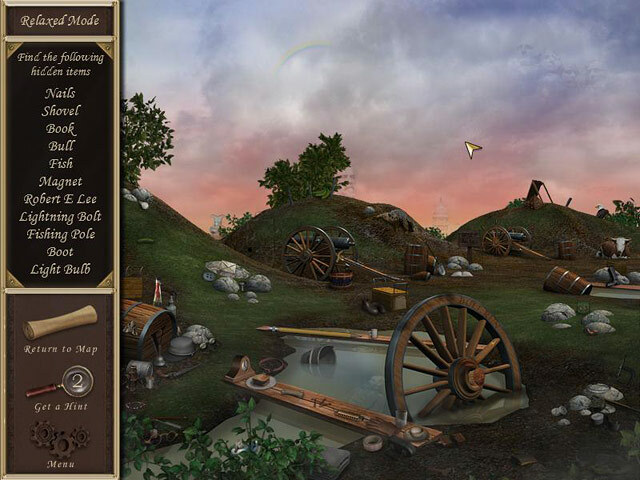 But it was still interesting to find the letters in the hidden object scenes and see how each character did during the war. One other thing that drove me crazy was the limited number of hints available. There were only 3 hints for an average of about 60 very-hard-to-find hidden objects. If you used them all up, too bad. You just had to keep looking and clicking. I do recommend the game, partly because I like most of this series. Just be aware of the problems and decide whether you can tolerate them while you play. Rated 3 out of 5 by CasualGran from A Real Challenge Yes! I've finished the game! This gives me a bit of a triumphant feeling cause boy! .. this was a difficult game. After the first chapters I almost gave up because of the teeny tiny objects now and then, if not almost invisible, and the few hints that were given per chapter. But then I discovered a written walkthrough on another website and I found out I could print screens and make them bigger in my computer tekst program. These two little helps made resuming and finishing the game possible and I liked it too, also because of all the historical info (bit of a pity they changed the ending, but allright, you can't have it all :-) ) Anyway, I'm glad I played this first Hidden Mysterie, cause I', a fan of the series and wanted my list complete. Rated 3 out of 5 by sirrap21 from Objects are very well HIDDEN! Great game that offers both fun and learning. My review is based on the trial only. I made it to 1862. Played timed mode which was extremely difficult so I created a new player and played relaxed mode which wasn't much easier. This appears to be a strictly HO game minus the adventures & puzzles I'm use to found in others. Some items are just way too small in which I had used up all of my hints in each scene. You definitely must have your 'eagle eye' focused for this one. I enjoyed the history tidbits about the Union & Confederate soliders. This was a nice touch. I'd recommend Hidden Mysteries: Civil War for those who love scavenger hunts but it was a little too much for me. I play these games to relax, after this I'm pouring myself a glass of wine! Rated 3 out of 5 by Mandar83 from Difficult I love history and hidden object games, but this was difficult and you don't get many hints. Good graphics. I just had a hard time keeping interest in it. Rated 3 out of 5 by Kendall_20 from Liked it but it could have been better... I got the game because being from the South (Texas) and having ancestors fighting on both sides, I wanted to see and understand what went on during that time in history. Some of the items were small, and kinda hard to find. The Court House towards the end was a hair pulling spot.... Other than a few other places where you really couldn't see what you were after, it was an OK game. The stories were pretty good but could have been a bit better. There should have been more in the General's story...hearing his wife's voice as he would read her letter(s) as he received them would have been good....Having the Union soldier's lady reading her's also might have helped too. All in all for a game such as this, it would be a 7 on a scale of 1 to 10 in my book.